Comprehensive Children's Music Curriculum. Growing in Grace. Released in 2014. Enhanced CD. Celebrating Grace #607031200. Published by Celebrating Grace (CG.CGGG14). 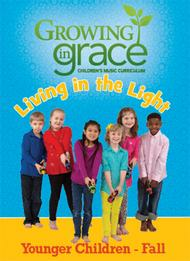 Growing in Grace is a comprehensive, faith-based children's curriculum with songs that are developmentally appropriate for children, both musically and theologically. "Living in the Light" from Growing in Grace Children's Music Curriculum offers two 15-week units springing from John 8:12, reflecting the powerful scriptural metaphor of light. Songs and activities help preschoolers discover music as a joyful means of expression and guide younger/older elementary children to connect music and worship, know Jesus as the Light of the World, and walk as children of the Light. Each semester's unit includes songs, hymns, demonstration and accompaniment recordings, KIDPages, Song Teaching Steps, small- and large-group teaching activities, and colorful visuals. Preschool and Younger Children units also include step-by-step rehearsal plans. Permission is granted to the original purchaser to print copies for students and teachers of ONE choir.